You can always add people or companies to your project from either your mobile device or the web. The People page serves as your project directory and contains profile information for the companies and people on the job, and once added that’s where you’ll see them. If you are adding Fieldlens users, both the users and their company will be added to the project. If you are adding someone that is not a Fieldlens user, you'll just need their email address. In this case, either you or the Project Organizer can add in their company and contact details from the People page. 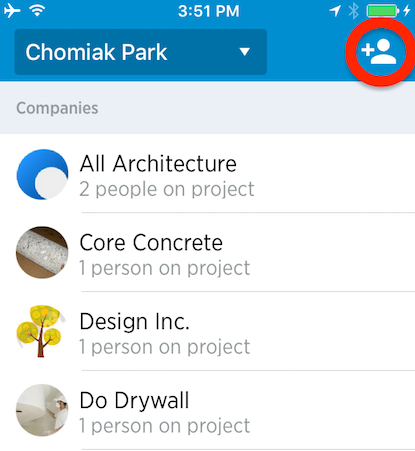 From the bottom of your project's Feed, tap the People icon to view the project's directory. Here you'll see a list of all the companies and people on the Fieldlens project with you. 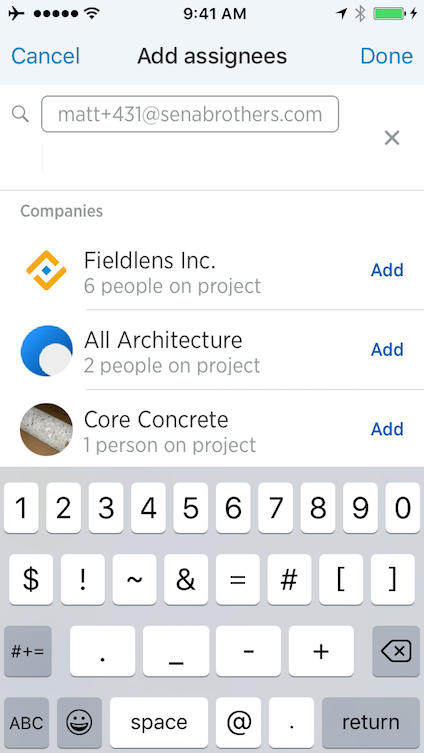 At the bottom of the list you can tap Add more people to project, or tap the + People button from the top right. Scroll down to see a list of people from your phone's contacts or type in an email address. Once you've specified the people you'd like to add, tap Next from the top right. Each person you add will receive an email invitation - keep the message as is or edit and personalize from this screen before sending. Similar to the mobile experience, you can quickly add people to a project from the web. Click into the People page from the top of your screen, and then select + Add people to project from the upper right. You'll see a pop up window with suggestions of people you've worked with before. You can also click the drop down menu to switch to a list of people just from your company. 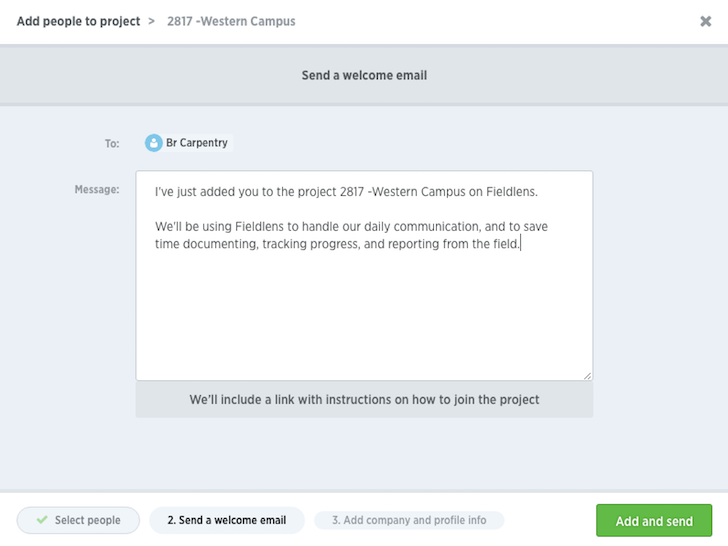 Click on a name to add them, or type in an email address to add someone new to Fieldlens. You'll see the selected people on the right-hand sidebar. Click Next to move on to the welcome email screen and when ready click Add and send. 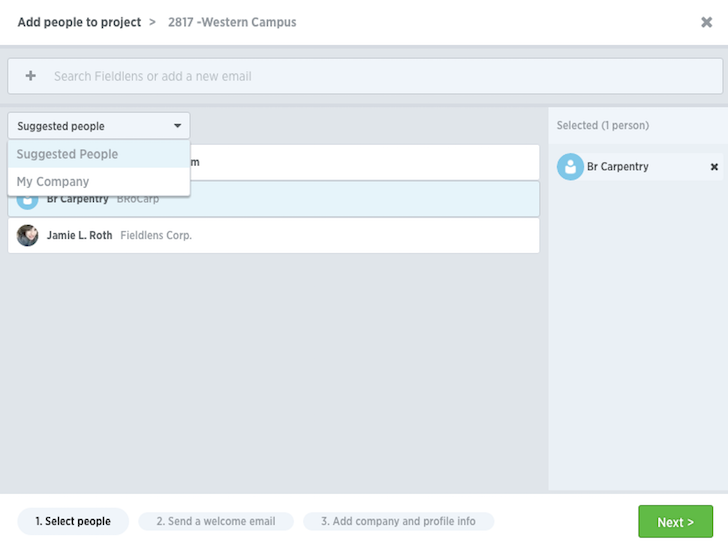 You can add a person to your project when creating a new post or adding to an existing post- simply include their email address in the Send to or Assignee fields. If the email address belongs to a Fieldlens user, both the user and their company will automatically be added to the Fieldlens project. If they are not a Fieldlens user, they will receive the post details in an email and their email address will be added to the People page.